The Maitland Conservation Foundation (MCF) works in partnership with Maitland Conservation to raise funds for watershed projects. The Foundation is a registered, charitable organization that is led by a volunteer Board of Directors. The MCF has been raising funds significant local projects since its incorporation in 1975. Middle Maitland Headwaters Restoration Project – assisting landowners to improve water quality and quantity by buffering watercourses and planting trees on marginal farmland. 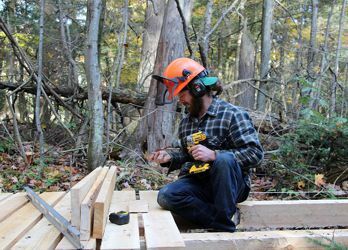 Wawanosh Valley Conservation Area – property improvements including boardwalk replacement, the creation of wildflower meadows and signage. 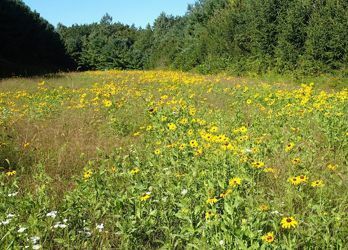 George Taylor Conservation Area – development of wildflower meadows. All donations over $10 are acknowledged with a letter of thanks and a receipt for income tax purposes. On-line donations to the Maitland Conservation Foundation can be made at canadahelps.org. 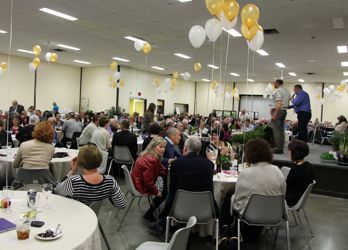 Annual Dinner and Auction – The 2018 Dinner and Auction will be held in April at the Brussels Morris and Grey Community Centre in Brussels. This year marks the 3oth anniversary of the Dinner and Auction and we’re in the midst of planning for our best one ever! If you have an idea for a unique auction item, or you’d like to assist with the event, please email us at foundation@mvca.on.ca . Memorial and Celebration Groves – located at George Taylor Conservation Area located south of Walton. For a donation of $100 a large-stock deciduous tree will be planted in memory of a loved one or in celebration of a milestone event. Smaller donations are also gratefully accepted. Individual trees in the groves are not identified with names; however donor and memorial names are listed on a kiosk at the site. To arrange for a memorial or celebration tree planting please call the Foundation at 519-335-3557 ext. 246 or email foundation@mvca.on.ca. Donations can also be made on-line at www.CanadaHelps.org. A 9-member Board of Directors oversees the operation of the Foundation. The Annual Meeting of the MCF is held in March. The MCF welcomes volunteers interested in assisting with fundraising campaigns or joining the Board of Directors. For more information please contact Phil Beard (519-335-3557 ext. 231) or Lori Gordon at (519-335-3557 ext. 246).